If There’s No Food Reward, Then Why Do I Eat The Whole Box Of Cookies? So what’s the controversy over Food Reward? Who could even doubt that it’s the high-availability (24 hr/day, everywhere, cheap, super-sized) of these highly processed addictive foods that makes us fat? Oh, right, Gary Taubes. Apparently, he couldn’t stomach the idea of someone with a real hypothesis which elegantly addresses the obesity epidemic, and that (indirectly) invalidates his own fixed-idea. So what should Taubes do? 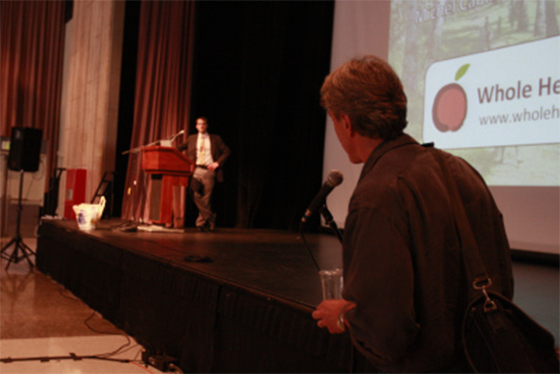 Hijack the Q&A follow-up to Dr. Stephan Guyenet’s Food Reward talk at AHS11 to personally attack him, of course. I saw the “incident” unfold a few years after it happened, while I was watching Guyenet’s talk on YouTube. It was a great talk, then he opened up the Q&A. Next I hear a familiar droning voice that I (WTF?!) recognized as Taubes. (He jumped the Q&A line to make his outburst.) He goes on about his apocryphal, tiny populations that got obese eating no calories while doing manual labor, and accused Guyenet of ignoring them in his work. Awkwardness ensues. This incident exposes something of a natural rift between the Paleo and the Low-Carb cliques at these types of conferences. They’re allies in their love for fat, especially saturated fat, and they both demonize wheat and most starches. However, there are some very fit Paleo eaters, and they find it necessary to fuel their workouts with “tubers” like sweet potatoes (never white potatoes, even though both are agricultural products). But since real Low-Carb’ers do ketosis, this theological rift is going to cause some problems. As it turns out, the Paleo side with Guyenet over the issue, and the Low-Carb’ers align with Taubes. One commenter noted that the Paleos resent the Low-Carb’ers as the “fatties” at these conferences, and associate Food Reward with personal responsibility. The Low-Carb’ers naturally go with the “insulin made me fat” story (since Gary Taubes confirms that exercise won’t help them lose weight). Anyways, look it up (Google: taubes guyenet ahs11). There’s a pretty good conciliatory post that attempts to bridge the two camps (but is more Paleo-oriented towards personal responsibility, and “calories count”). PS: I always wonder if Dr. Doug Lisle’s Pleasure Trap video would help the Low-Carb’ers. He explains the real reasons why obesity isn’t a personal short-coming. It’s natural in this food environment. And you don’t need extreme measures like cutting out all carbs to break the Pleasure Trap.